Her Majesty Queen Rania meets with First Lady Michelle Obama in the Yellow Oval Room on the second floor and private residence. Queen Rania is an active mom that also attends her children's soccer matches as do the Obamas. Photo courtesy of White House. Royal status arrives upon birth or a wedding fit for a king, queen, prince or princess. A first lady must travel the interstate and freeways of the nation and meet thousands upon thousands of happy, upset, aggrieved or excited people in the tiniest hamlets and the biggest cities before getting the keys for a four year stay to the world's most famous executive residence. The White House at 55,000 square feet with 35 bathrooms is rather small in comparison to Tokyo's Imperial Palace, Buckingham Palace or the Palace of Versailles. Modern royals interact more with people and promote causes and charities on the international stage. 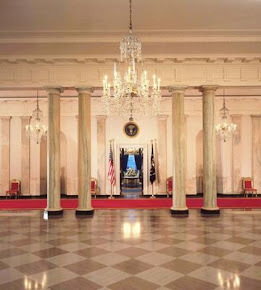 Traditionally, the formal place to meet privately with royal guests is in the Yellow Oval Room. It is also where select guests meet before two heads of state descend the Grand Staircase for a formal state dinner of which the Obamas are yet to host. Barbara Bush gifts Princess Diana with a book dictated to her by her dog, Millie. Photo courtesy the George H. W. Bush Library. Friendships that last a lifetime spring up among American first family's with many royals as they are very familiar with the shared isolation known as the impenetrable Bubble and the protocols for heads of state. One o f my favorite stories from last year was candidate Obama went to the Middle East, including Jordan and to the Aqaba palace. As a candidate he did not have formal privileges to get a ride from the State Department. King Abdullah II bin al-Hussein drove him to the airport in his own personal car. They broke the speed limit and both president and the King are Trekkies. As seen in the top image now their powerful spouses are getting a chance to know each other as well. From Former First Lady Nancy Reagan came to the White House for Prince Charles and the Duchess of Cornwall's visit for the formal dinner. Nancy Reagan and the president both attended Lady Diana's 1981 royal wedding deluxe to Prince Charles. She hosted the very famous dinner for their visit that had a svelte Princess Diana twirling across the floor with John Travolta in the Grand Foyer which works marvelously well as a dance area. Prince Charles & The Duchess during their visit with President George W. Bush and the First Lady. Malia's will get a teen-scale briefing on the formalities for her first formal state dinner akin to the scene from the movie Pretty Woman where all the knives, forks, goblets get a full explanation. White tie dinners at 1600 Pennsylvania Avenue are rare and usually reserved for Kings & Queens. Black tie is for everyone else of extraordinary rank including the Prince of Wales and Camilla on their first visit after their nuptials. The last was in 2007, when President & Laura Bush entertained Her Majesty, Queen Elizabeth II & her husband Prince Phillip on a full state visit. Michelle Obama & the Queen Elizabeth are quite chummy with phone calls and two visits to Buckingham Palace by the First Lady. Malia & Sasha got a personal tour and met Her Majesty afterwards for a spot of tea and what had to be some delightful scones. 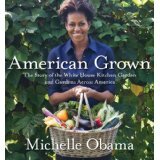 A former Princess and mother of two princesses, Sarah Ferguson quietly went to the White House to lobby Michelle to participate in a charity project. The Duchess of Cornwall and her husband Prince Charles met the Obamas during the G20 summit at a social even hosted by the Queen. He focused on the Kitchen Garden. Not too many are aware that the Queen has started a little patch with her own veggies on the palace grounds. President Clinton, Queen Noor, Hillary Clinton and his Majesty King Hussein of Jordan have an American style Lunch complete with french fries. It was one of the last happy visits to the USA before King Hussein succumbed to his illness. Kings have friends among American presidents. The American-born Queen Noor visited the White House often with her husband King Hussein. In 1998, Hillary Clinton held lunch for the King & Queen of Jordan on the Truman Balcony. The balcony is accessed from the Yellow Oval Room where a more casual setting can take place. First Ladies plan each detail when meeting with royals. The amount of protocol can be overwhelming as Michelle found as she exchanged a fond pat with Queen Elizabeth. At the reception in Buckingham Palace, the bonding Moment seen round the world. President & Mrs. Obama meet for the first time in Her Majesty's formal living room at the Palace. The waves of royals have a generational component that works well with the Obamas. Felipe, HRH The Prince of Asturias has a very young family with former television anchor as his Princess, Letizia. His suave parents the King & Queen Sophia of Spain are still on the throne. From Japan, the new Prime Minister's wife has made no secret of her desire to meet Michelle Obama. The Emperor & Empress of the Chrysanthemum Throne will be a highly structured first meeting for the Obamas. The Crown Prince Naruhito of Japan & his American educated former diplomat & lovely wife Crown Princess Masako have yet to meet the Obamas and they have a young daughter near Sasha's age. In the Yellow Oval Room (seen from another angle) the Obamas host the Dutch Crown Prince, Willem-Alexander, Prince of Orange & Crown PrincessMáxima of the Netherlands in September 2009. Their oldest child is five. Note: My hand is now better and I have better motor control to type. My shoulder well we'll keep hoping....Stay tuned for the next post.